Restoring true Health and Wellness through the balance or reduction of nervous system interference and alignment of the human frame allowing the body to heal itself and function naturally. Our ideal patient is the type of person who really wants to get healthy and will do what it takes to make that happen. Everyone is looking for the “Magic Pill,” but it doesn’t exist. We have achieve great results with many musculoskeletal and nerve related conditions–and most aches and pains are just that. If you can restore normal motion and balance in the joints and reduce nervous system interference, the body will have the ability to heal itself and attain maximum wellness. Our philosophy concerning patient treatment consists of a partnership approach in which both parties have made a mutual commitment to improve the patients state of health and well-being. Our goal is to make an accurate assessment of the patient’s condition, inform and educate the patient about their state of health and options for treatment. Our options for care address more than just symptomatic care. We resolve to fix the problem as best as it can be and teach methods to help to maintain the balance once attained. Prevention of future health problems is our main goal. Most of the time, the condition was the result of abnormal stress through a joint or joints over a period of time that finally became inflamed and painful. The stress is usually the result of improper biomechanics such as misalignment of the joint or imbalance of the associated muscles. When this happens there is nerve interference and then the health of the connected area declines and creates disease. Regardless of your health goals, our job is to offer you the finest chiropractic care possible, and it’s up to you to decide how much of it you want. Sound interesting? Please contact our Crestwood chiropractic office to make an appointment. What others say about chiropractic care can help you make the right health care choice. Review a selection of Chiro-Med Health & Wellness patient testimonials below and please contact our Crestwood chiropractic office if you have any questions. If you’ve been to a chiropractor before and prefer to be adjusted in a particular way, let Dr. Revello know. We want you to relax, enjoy and fully benefit from your chiropractic care. 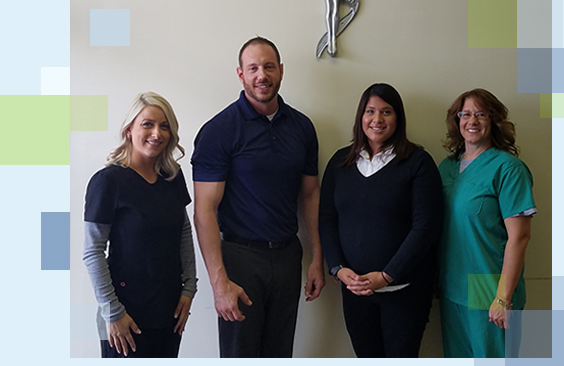 Chiro-Med Crestwood Medical and Office Staff are simply the best.